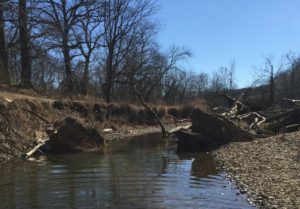 The Watershed Conservation Resource Center (WCRC) was contacted by the NWA Trailblazers to evaluate streambank erosion conditions along a proposed section of Razorback Greenway that is planned to run adjacent to Little Sugar Creek in Bentonville Arkansas. The property is owned by the City of Bentonville. The site is located approximately 1,000 feet downstream of the Lake Bella Vista Dam and has a watershed area of 86 mi2. The NWA Trailblazers staff is concerned about ongoing streambank erosion and its impact on the proposed trail due to the close proximity of the trail alignment with Little Sugar Creek. A potential streambank restoration project would both protect the trail from scour or loss, while at the same time help to prevent streambank erosion and the negative effects of sedimentation. Prior to visiting the site, the WCRC evaluated the magnitude of erosion over a ten-year period (2007 to 2017) using aerial imagery and found the streambank in question had eroded as much as 24 feet, in some places. The erosion rate poses a threat to the proposed trail alignment. Based on the site visit, the primary mechanism for the bank failure is erosion of the toe with subsequent cantilever failure of the upper banks. 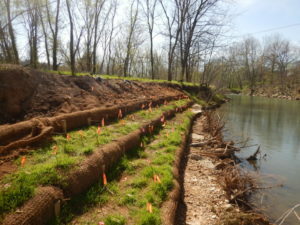 Restoration would involve fortifying the toe of the streambank using natural materials and creating floodplain features. The restored streambank would be created with a resistive revetment of logs, brush, gravels, and boulders. Such an approach would provide resistance to scour during a vegetation re-establishment period (3-5 years) after which, the area should remain stable, barring catastrophic flooding.